Despite recent increases in California’s state funding for K–12 education, cost increases in many school districts are outpacing revenues. A series of WestEd reports identifies this period of fiscal challenges as a “Silent Recession” that is not unique to California. Many budget leaders are finding strategies to navigate the Silent Recession by focusing on improving both cost-effectiveness and student outcomes. Parents of students in the San Jose Unified School District were understandably pleased when the amount of state aid began increasing five years ago as a result of California’s new Local Control Funding Formula (LCFF). Still, it didn’t take long for disappointment to set in. “One thing parents really wanted to know was why San Jose Unified wasn’t using that money to reduce class sizes,” recalls Stephen McMahon, the district’s deputy superintendent and chief business officer. At the time, the average class size stood at 30 — even in kindergarten — a figure McMahon says was higher than in neighboring districts and needed to be considered. Yet, even with the spike in state revenue, district officials could not improve on that number because “our cost-per-employee was going up at a faster rate than our revenue,” says McMahon. This dynamic is not unique to San Jose. 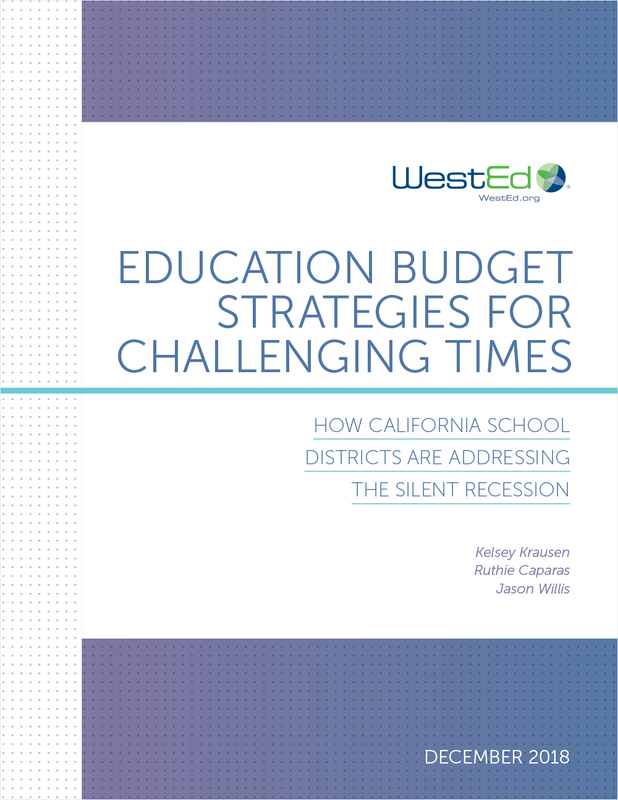 Two recent reports from WestEd researchers identify a “Silent Recession” in which costs are rising so dramatically that many districts are experiencing the increased funding as being woefully inadequate. Silent Recession: Why California School Districts Are Underwater Despite Increases in Funding, lays out the often bleak conditions of costs outpacing revenues. Although this dynamic forces districts to face what McMahon calls “increasingly severe budgetary challenges,” there are silver linings as well. The second report, Education Budget Strategies for Challenging Times: How California School Districts Are Addressing the Silent Recession, reveals that some budget leaders are responding to the Silent Recession not simply by cutting back but by focusing on cost-effective ways to improve education in their districts. A third report, on state-level strategies for addressing the Silent Recession, is in development. WestEd developed the reports as part of the Smarter School Spending project, funded by the Bill and Melinda Gates Foundation. The project aims to help school districts prioritize spending in ways that will increase student achievement. 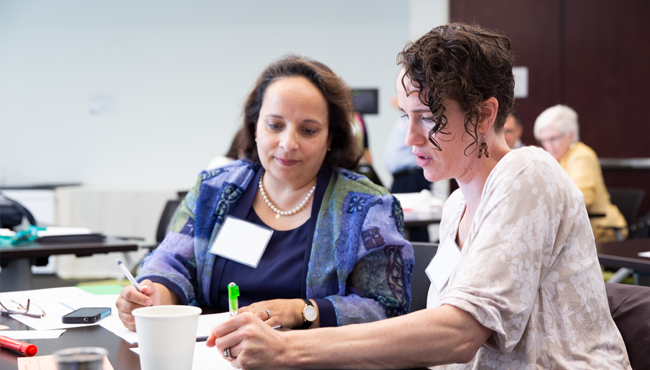 Between February 2016 and June 2018, WestEd convened budget and education services leaders from a number of California school districts and county offices of education for a series of group discussions. One-on-one, follow-up interviews examined financial challenges and how the leaders were responding. WestEd researchers also interviewed chief business officers (CBOs) from additional districts and another county office of education to ensure that the findings accurately reflected the diversity of California’s school districts. Lastly, researchers analyzed the 2017 budgets of 25 school districts and statewide financial data. From this process, the reports’ authors learned that scenarios like that of San Jose have been playing out across California and the nation for almost a decade. Budget leaders throughout California described facing similar challenges even as they have welcomed the additional state aid designed to help their districts reach pre-recession funding levels. Residents of Oakland, for example, were unhappy when they learned their district was closing a number of schools to balance its 2012 budget, and they were newly devastated to learn that many more such closings loomed — despite the annual increase in state aid their district was getting with the LCFF. 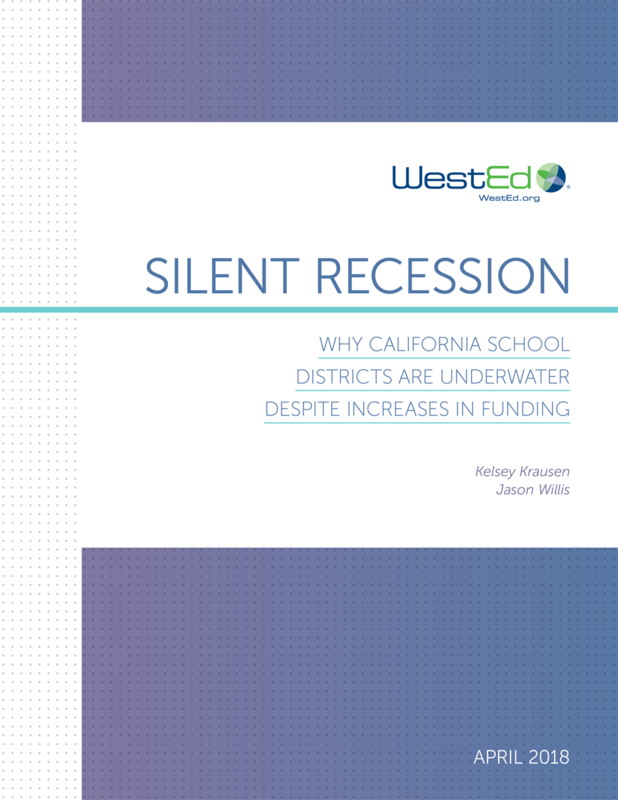 WestEd’s first Silent Recession report notes that districts began experiencing serious budget shortfalls in 2008 in the wake of state revenue decreases due to the Great Recession. In response, they were forced to make painful decisions to cut programs, curtail services, and reduce staffing. “As a result, in our interviews with CBOs we heard over and over again that ‘We’ve already cut costs everywhere we possibly could; there’s nothing left to cut,’” says Krausen, the lead author on both reports. Indeed, she notes, despite the LCFF legislation that saw state aid jump back up beginning in 2013, costs rose even faster. Between 2012 and 2017, for example, overall expenditures increased by 21 percent for teachers’ salaries, 49 percent for employee benefits, and 75 percent for books and supplies. In many districts, costs have also been rising for maintenance or replacement of aging school buildings. Districts with declining enrollment — resulting in fewer students to educate — have not seen commensurate declines in costs, according to Krausen. “You often can’t reduce staff based directly on the number of students you lose, because you never lose, say, an entire class of seventh graders.” Nor can districts reduce most utility or maintenance costs when enrollment declines. What’s more, because state funding formulas are calculated on a per-pupil basis, declining enrollment packs a double punch by reducing revenue. The problem is not confined to California. “We know from our work in other states that there’s a general trend toward increasing state revenue to restore school revenue to pre-recession levels,” says Krausen, noting that funding still has not typically reached pre-recession levels. Meanwhile, all over the country school districts have been facing steep cost increases in areas such as employee pensions, special education services, and deferred maintenance. The WestEd reports point to research indicating the high cost of replacing teachers, which ranges from $10,000 to $20,000 per teacher and totals $8 billion nationally. Seeing a budget shortfall in a positive light may be difficult, especially as WestEd’s first report on this topic predicts that the “Silent Recession will continue to constrain district budgets into the foreseeable future.” However, Krausen and colleagues urge school officials to make the most of a difficult situation. “We see this as an opportunity to really maximize the efficiency and effectiveness of school district operations, even if you’re motivated by necessity,” says Ruthie Caparas, a WestEd research assistant who — along with Jason Willis, director of strategy and performance for the Comprehensive School Assistance Program — co-authored the Silent Recession report. “Often, one of the outcomes can be the adoption of best practices that you and your districts will benefit from long into the future,” even when the economic context is stronger. In that spirit, WestEd’s second report describes school leaders’ efforts to find new ways of “creating the type of education system that all children deserve,” spelling out strategies that budget leaders have used to improve education with increasingly limited dollars. Caparas praises the CBOs’ efforts. “We’ve found their ability to come up with strategies that improve both cost-effectiveness and student outcomes — and to share their ideas with each other — very encouraging,” she says. One school district, for example, set up a robust teacher evaluation system as a way of ensuring that its largest expenditure — teacher salaries — was in fact being used to employ highly qualified teachers. The move, created in partnership with the local teachers’ union, became a central point of the district’s school improvement process. Ultimately, it not only boosted student achievement but also engaged the union in the district’s long-term decision-making. A number of districts have worked to improve student attendance rates, which has great potential for increasing revenue under state funding formulas. For example, according to research cited in the second Silent Recession report, if every student in the Los Angeles Unified School District had attended one more day of school during the 2016/17 school year, the district would have received an additional $30 million in revenue. Perhaps even more important is the strong, widely recognized link between increased attendance and higher student achievement. Budget leaders also described a variety of smaller but creative ways to boost revenue or decrease costs. Some have generated income from leasing space to communication companies that place cell phone towers on school campuses. Others have lowered costs by ensuring that water for tasks like watering football fields is not billed at the higher rate charged for drinking water. Learn how increasing costs are forcing many California school districts to make dramatic program adjustments and reductions, and risk significant deficit spending. 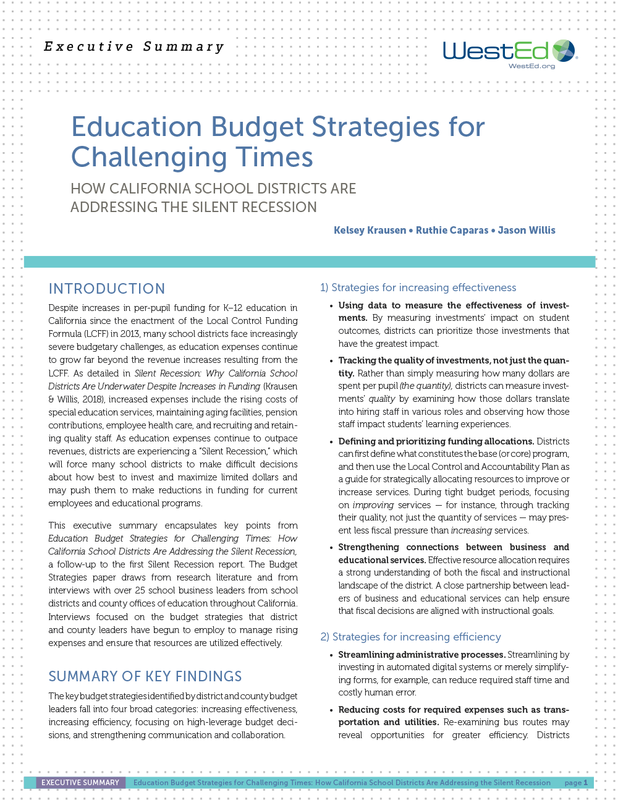 This executive summary outlines key budget strategies identified in the report, Education Budget Strategies for Challenging Times: How California School Districts Are Addressing the Silent Recession.